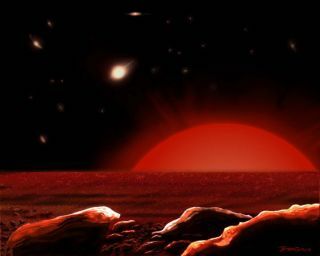 Artist's conception of the view of a hypothetical planet around a distant red giant star. Our sun is expected to swell in a few billion years to first fry Earth then engulf it. Editor's Note: This feature article is part ofSPACE.com's weekly Mystery Monday series. Welcome to the last day on Earth. Humanity's descendants have long sincedied or fled, oceans have long since vaporized, and the life-giving sun hasballooned into a swollen giant filling the sky. Scientists have debated for years what will happen to our planet whenthe sun's fusionfurnace begins to run out of fuel and swell into a red giant a few billionyears from now. The most recent simulations suggest that Earth will end upbeing swallowed by the dying sun. The impending doom is more dire than any fictional villain could everwish upon a world. Yet the planet need not perish if future civilizations cansomehow move Earth out beyond the danger zone. Barring that, a clever escapeplan might prove useful. The fate of life on our planet has always depended upon the sun'sdestiny. Astrophysicists can trace both the sun's past and future based ontheir understanding of stellar evolution, which comes from observing stars ofmany types and at different stages of life. Largerstars typically meet their end in spectacular supernovaexplosions, and leave behind either neutron stars or black holes. Butmid-size stars like the sun experience a more gradual transformation, afterthey consume the last of their hydrogen fuel and start burning helium. Helium burning leads to higher core temperatures that would cause thesun to start swelling into a red giant, around 5 billion years from now.Simulations show the sun eventually expanding to around 250 times its currentsize. Previous studies showed that expanding sun would engulf Mercury andVenus, while Mars would remain safely out of reach. But Earth remained in azone of uncertainty because of its location between those planets. A faintchance existed that the sun would lose too much mass before getting too big,and would allow the Earth to escape into a wider orbit as the sun loses itsgravitational grip. Now any hope for Earth's final salvation may have finally died. Britishastronomers ran a simulation in early 2008 which included the sun's weakenedgravitational pull, and the Earth moving outward in response. "If that were the only effect, the Earth would indeed escape finaldestruction," said Robert Smith, emeritus reader at the U.K.'s University of Sussex. "However, the tenuous outer atmosphere of the sun extends a longway beyond its visible surface, and it turns out the Earth would actually beorbiting within these very low density outer layers." That low-density gas would cause enough drag for the Earth to driftinwards, even as tidal forces caused by the Earth's gravity force the nearestside of the sun to bulge outwards. The Earth eventually drifts into the bulgeand endsup vaporized, around 7.6 billion years from now. However, life has even less time than the planet. Most scientists agreethat every living thing faces certain extinction 1 billion years from now, whenthe sun's growing brightness transforms Earth into a global desert. Droppingcarbon dioxide levels would starve plants of the ability to conductphotosynthesis, and that would lead to the inevitable death of all livingthings. A long shot exists for life to survive Earth's fate, but it wouldinvolve some novel solutions or a serious space colonization effort. One team at Santa Cruz University in California has proposed capturing apassing asteroid and using its gravitational effects to "nudge"Earth's orbit outward. A continuous asteroid passage every 6,000 years or socould keep Earth at a comfortable distance and give life another 5 billionyears on the planet. People leery of miscalculations with the asteroid solution could alsoturn to good old fashioned engineering. Humans may find new homes among theasteroid belt, the outer planets, in artificial colonies, or perhaps beyondthis star system. "Space is disease and danger wrapped in darkness andsilence," complains Dr. Leonard "Bones" McCoy of "StarTrek," but even life aboard a starship would beat species extinction. "A safer solution may be to build a fleet of interplanetary 'liferafts' that could maneuver themselves always out of reach of the sun, but closeenough to use its energy," Smith suggested. The sun will eventually lose most of its mass as it becomes a whitedwarf, and could come to resemble other burnt-out star systems spotted byNASA's Spitzer Space Telescope in a 2009 study. About 1-3 percent of whitedwarf stars seem to contain dust and rocky debris, which may represent remnantsof rocky planets such as Earth. By that time, humanity should have either found its new foothold in theuniverse or long since ceased to exist.